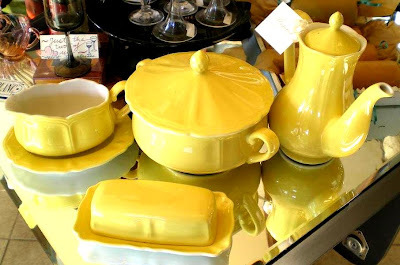 We snagged this absolutely pristine set of Ironstone Federalist pieces, perfect for your summer table. Included in this amazing vintage set is a Coffee/Tea pot, a covered sugar bowl, creamer with matching saucer and butter dish with saucer and lid. There is not a mark or chip throughout, each piece is in perfect condition. The soft, buttery yellow is so cheery and is sure to brighten up a summer setting. From the 60s, the fluting details really set this set apart from the rest. Available for purchase online, we pack carefully for shipping. Give us a call or use the contact option on the blog for details!